Midwest saw a superstar class of Junior Five-Gaited horses, but among them one mare stood out, as she has ever since she stepped foot into a show ring last August. She is, to date, undefeated. Her name? There’s Something About Mary. There's Something About Mary made another one of her electrifying performances, winning the Junior Five-Gaited class with Bret Day and being named Best In Show. Photo by Doug Shiflet. 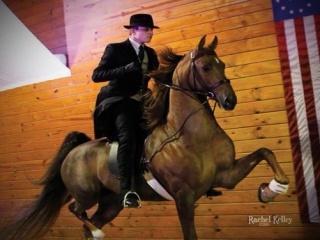 Ironically, the chestnut mare is called Molly, not Mary, and in her only appearance at Midwest with Grey Ridge trainer Bret Day, she brought the house down as the Junior Five-Gaited Champion. By Undulata’s Nutcracker and out of Heirudite (Supreme Heir x Carol Lynn [BHF]), she started life with the registered name Maybe Nut, but her new name seems even more fitting, as she has an indescribable quality about her that makes the crowds go wild. Molly actually arrived at Grey Ridge in August of 2014 not to be a show horse, but to be a broodmare for client Carroll Robertson Ray. 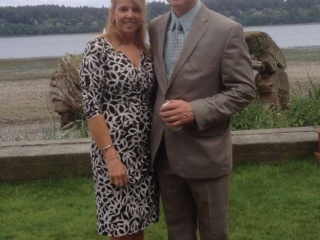 Bret and Susi Day became interested in the mare when they saw posts about her on trainer Tammy Devore’s Facebook page. They contacted Tammy, who told them about Molly and named the sale price. Bret watched the mare work and liked what he saw. 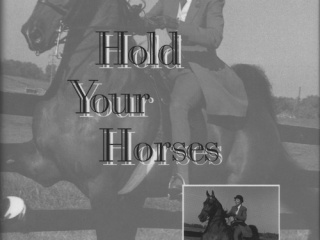 When Molly went on to win her debut outing — the Three-Year-Old Five-Gaited Mares class at Louisville — Bret and Susi knew she was the horse Carroll was looking for. Under the Grey Ridge banner, Molly just kept rolling. 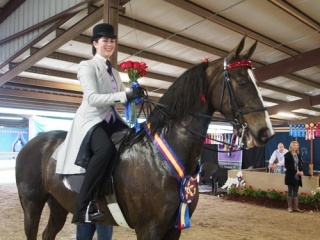 She won again at Kentucky Fall Classic, and then went on to take the UPHA Five-Gaited Classic Grand Championship at the American Royal that November. 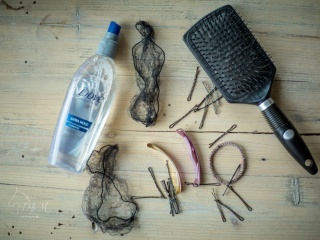 “Every single time she keeps getting better,” Susi said. This was true once again at Midwest. 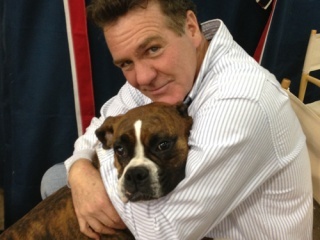 Bret’s goal going into the class was to stay out of Molly’s way but keep her rated. “Every step the first way trotting I’m saying, ‘whoop, whoop,’” he said. CH Callaways Winning Number took the victory pass in the Adult Country Pleasure qualifier and championship with Marjorie Townsend. He could tell that the crowd was cheering, but at first he wasn’t sure who the cheers were for. “When you’re in there with those kind of [top] horses, you hear the crowd but they could be cheering for someone else,” he said. But, from the rail, Susi could tell that many of the cheers were for Molly; she told Bret that he needed to get by himself. By the second direction he and Molly were able to make a couple passes on their own, giving the crowd the chance to show their appreciation. 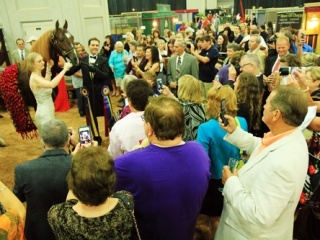 The performance ended in a blue ribbon and victory pass, but there was something else special about that night as well — it was the first time since Carroll bought the mare that she had been on hand to watch her show. According to Susi, training Molly is mostly just exercising her. Bret describes it as directing and channeling her energy. He jogs her a lot, and when it’s closer to a show he rides her about twice a week; she is the same every time he gets on her back. Occasionally he’ll attempt to give her a break and turn her out in the bullpen to let her play. “You want to do that to give her a little reward but you’re holding your breath hoping she doesn’t do something to herself,” he said. Camille Cowart gets some last minute instructions from father Peter before entering the ring aboard Undulata Pressure. This pair was the Amateur Five Gaited Champions and Grand Champions.But both Bret and Susi believe that she needs the downtime. This focus and drive is what makes her such a great show horse, but Bret and Susi know that this all-business attitude could easily be misused. Because of this, Molly’s next appearance won’t come until the World’s Championship Horse Show in August. 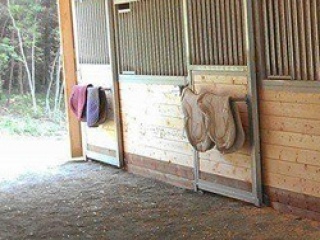 Caring for a horse like her is a balancing act, and these acrobatics can be stressful. 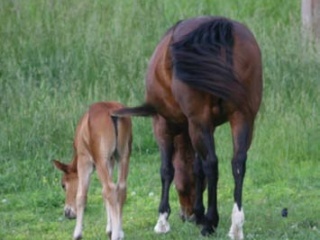 But Carroll has a way of putting things in perspective for Bret, Susi and everyone else involved with the mare. Because of this, Susi knows that Molly is not for sale. “They’ve had the opportunity to sell her over and over again, but their purpose for buying her was to breed her, and that’s what they’re going to do,” she said. But when a horse has excep­tional talent like Molly’s, it’s hard to not get excited. Jim Lowry borrowed the Mutrux's Haflinger, Chester, for the Trainer's Equitation class. The crowd loved it, and Chester now has his own Facebook page. Photo by Doug Shiflet.There are no real rules for the ASHA Trainers’ Equitation Cup classes, so you never know what you’re going to get. At Midwest, what transpired was a strange and entertaining mix of talent and hilarity, and a class filled with 17 riders, a number of World’s Champion horses … and one Haflinger pony. Erin Boggs Richey returned to her equitation roots and rode a flawless pattern to take the unanimous win. Her mount, Madeira’s Fame, or “Thomas,” belongs to her equitation student Aleia Brown. 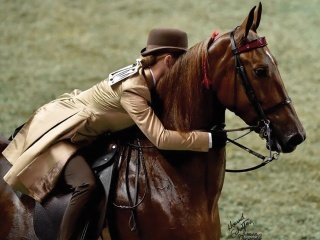 She and Aleia have a special relationship, and it was Erin who picked Thomas as her equitation horse. The last time they were at the Illinois State Fairgrounds it was for Mid-America Mane Event, where Aleia and Thomas won the Good Hands Finals. Now, in the same arena and with the same horse, it was Erin’s turn, with Aleia cheering them on from the rail. 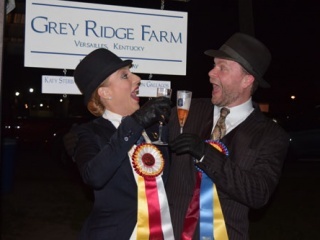 Donna Pettry-Smith, another former equitation star, took the reserve honors aboard Highpoint’s Golden Angel or “Jerry,” winning back her own “Broken Dreams” wine, which she had preemptively (and a bit ironically) donated to the reserve winner in a gesture of good-natured jesting. The wine was just one example of how Donna made the most of the experience; tee-shirts, videos, hashtags and a constant presence on social media gave her one of the biggest fan bases and made her the class’s top fundraiser, singlehandedly raising $10,000 of the total $25,000. Todd Miles took third place aboard the equitation star Lemon Shake-Up WRF or “Watson.” DeLovely got into the act with appropriately-themed refresh­ments before the class — sandwiches served with lemonade and “adult” lemonade, the table decorated with a yellow tablecloth, yellow napkins and yellow signs to support their fearless leader. Though he did not make the top three, there is another male rider that deserves mentioning, as he perhaps got the most applause and definitely the most laughs. Jim Lowry had a surprise catch ride for the evening, the Mutrux’s pony-sized Haflinger, Chester. When he entered the ring on a horse half the size of the other mounts, the crowd roared its appreciation. Chester has made a number of appearances at Saddlebred shows, in the leadline and academy classes as well as some of the fun classes at MHSA Bridlespur Kick-Off such as “Texting While Trotting.” While he took off in his first Texting While Trotting class, he has become a show ring pro over the past few years, and he and Jim performed an admirable pattern and even took the 8th place ribbon from a large field. It seems a second set of ribbons would not go amiss in this class: Funniest, Most Improved, Crowd Favorite, etc., could have all easily found homes. Vickie Byrd shares a mint with Amateur Masters Five Gaited Champion Iconium. When Vickie Byrd rode Iconium to win the Five-Gaited Amateur Masters class, the crowd’s applause and the look on her face made it obvious that there was a very special story behind the win. 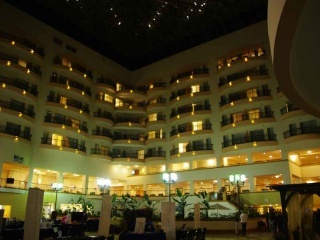 Iconium is named after a Biblical city in the Middle East — what is modern day Konya — but Vickie calls him Ike. She and Ike were both raised in the Carolinas, and Vickie first looked at him when he was three years old, though she didn’t purchase the now-thirteen-year-old gelding until two years ago. 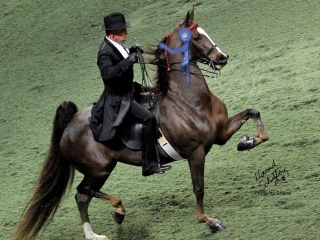 Vickie has really been the only Amateur that’s shown Ike, and in their first season in 2013, they won the Ladies Five-Gaited class at the North Carolina State Championship and took second in the Ladies Five-Gaited Stake at the American Royal under the High Caliber banner. The 2014 season was looking bright until it was cut short when Ike sustained an eye injury. Not only did he miss most of the 2014 show season, but there were complications during his eye surgery, and he almost died. He was in the hospital recuperating for almost 100 days. Recovered and back in the show ring this year, Vickie and Ike have been making a splash, with a win at Raleigh Spring Premier and top ribbons at J.D. Massey. Robert Gardiner Bob Brison and Three Gaited 15.2 Under Champion Callaways Blaire waiting for the gate to open.Last year was the first year High Caliber attended Midwest, but with Ike on the sidelines recuperating, Vickie did not get to show. She got her chance this year, and she and Ike did not let it go to waste. The noise in the coliseum was deafening when they were called for first. The class was special, too, since it was a rare win for Vickie, who laughs about the fact that she and Ike almost always take home second or third. But, no matter the ribbon, she knows she can trust Ike to give her his all every ride. “I keep thinking at some point his age is going to affect him, but it hasn’t yet,” she said. Emma Von Ballmoos was the UPHA WalkTrot Challenge Cup 10 Under champion aboard Gypsys Cosmopolitan. , or ”Ellie,” but Emma rides as if she and Ellie have been a team for much longer. Her parents Jaisen and Meghan von Ballmoos are the owners and trainers at Fairview Stable, LLC in Vermont, and Ellie belongs to their client Edward Leonard. She has spent the majority of her show ring career as a three-gaited horse, and last year she was mostly shown by two junior exhibitors, Abby Tate and Caitlin Bevins. When Caitlin rode Ellie to a third place finish in the Three-Gaited Junior Exhibitor 13 & Under Div. 1 class at Louisville, Jaisen and Meghan realized that Ellie was meant to be a kids’ horse, and they decided to show and market her that way with the help of daughter Emma. “She really likes kids,” Emma said. Emma is the youngest rider to ever show Ellie, and the only person to show her as an equitation horse. You can tell that Ellie enjoys her young rider by watching how well the mare responds to Emma when they’re in the ring, and their record speaks for itself: three shows, five classes, and four blues. Their only non-blue ribbon — a second place — came in the Saddle Seat Equitation Walk/Trot 10 & Under class at Midwest, but the pair still left the show with a win, taking the victory pass in the UPHA Walk/Trot Challenge Cup 10 & Under class. Emma’s goal, however, is not blue ribbons, but great rides. She describes Ellie as “really bold” and knows that she has to keep Ellie’s attention on her when they’re in the ring. However Ellie is also very dependable. Even Jaisen and Meghan’s younger daughter, eight-year-old Maddie, can ride her at home. Meghan is proud of what Emma and Ellie have accomplished, but she knows that, as a parent, she also expects a lot of her children. However, what she is mostly coaching Emma on right now is her expression, as she has a tendency to make silly faces while concentrating in the ring. Expression will be even more important later in the season — if Ellie is still around in August, the pair will take on Louisville. After that, Emma, who has already won two World Championship honors in the Saddle Seat Equitation Walk/Trot 11 & Under class at the Morgan Grand Nationals, may move onto canter classes. Rose Arbor Destiny and John Conatser were the Junior Fine Harness and Fine Harness Championship winners. Photo by Doug Shiflet.Topping a stunning Junior Fine Harness class was the breathtaking stallion Rose Arbor Destiny, driven by John Conatser. This four-year-old stud was undefeated for all of 2014, winning at all four of the shows he attended and being named the ASR National Futurity Three-Year-Old Fine Harness winner at the Kentucky State Fair, as well as the UPHA Fine Harness Classic Grand Champion at the American Royal. He won the Junior Fine Harness class at Bonnie Blue in his first appearance this year, before arriving at Midwest to take not only the Junior Fine Harness blue but the Fine Harness Championship as well. By Undulata’s Nutcracker and out of CH She’s My Desire BH by CH Harlem Town, Rose Arbor Destiny was bred and raised by Joellen Blount. He was still green when he arrived at Carriage Lane as a two-year-old, but he already had a pretty good start on his basic training. 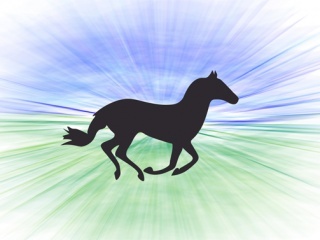 John believes that horses will tell you what they’re going to be if you watch and listen to them, and it wasn’t a month or so after they broke him to jog that they saw how much potential he had as a fine harness horse. In an interesting twist, his very first class in fine harness was at Midwest two years ago, when he won the Two-Year-Old Fine Harness class there in 2013, and he has been topping the division ever since. Three Year Old Three Gaited winner Crackin Up prepares to enter the ring with Neil Visser.John believes it is his way of going that makes him such a perfect fit for fine harness. The stud will show again at the World’s Cham­pionships in August, and then it will be on to Kansas City to display that beautiful trot at the American Royal. The Thursday before Midwest began, Sally Grieme was laying in a hospital bed. By Wednesday morning she was driving CH Sapphire On Ice or “Boozer” to the Country Pleasure Driving win, and would go on to repeat the same feat in the championship. She had purchased Boozer in April of 2013 as a riding horse but, due to medical issues, she wasn’t able to show nearly all that season. However, when her doctors cleared her to drive in October, she seized the opportunity and began showing her under saddle horse in harness. 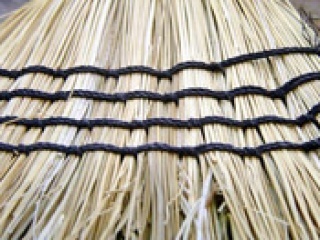 What followed was stunning success. Sally had never driven Boozer before they entered the ring at the Kentucky Fall Classic that year, but they won both the Show Pleasure Driving qualifier and stake. “Sometimes things just work out for the best all the way around,” Sally said. 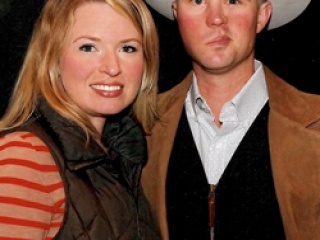 In 2014, the pair shifted gears a little, entering the country pleasure division. “It doesn’t make any difference whether he has pads on or not — he trots the same,” Sally said. In their new division they were top three every time out, with mostly blues to their name, even winning the Country Pleasure Driving Div. 2 World’s Championship. The 2015 season was looking bright until Sally was hospitalized for residual problems right before Midwest. Luckily with a change of medication she was released, and released in time for the show. While some people may have understandably called it off, Sally had no intention of scratching. 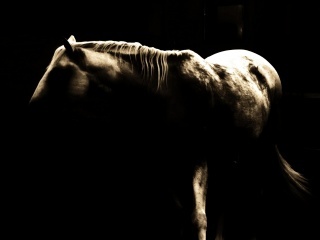 In fact, for her, the horses are a stress relief, from medical issues and anything else. Lauren Arquilla and College Man took the tricolor in the Pleasure Equitation 14 17 Championship.Lauren Arquilla wasn’t thrilled to be the last rider to do the pattern in the Pleasure Equitation 14-17 Championship. She was riding College Man, a horse she had borrowed the previous year, and bought in the off-season. He was only seven years old, and had been a show pleasure horse until Lauren began riding him, so he was still learning his pattern work. The waiting was nerve wracking, and Collin didn’t like standing around. Lauren’s previous mount, CH-EQ A Sweet Sensation, more commonly known as “Chema,” had been a pro at pattern work, but as Chema got older she was no longer able to keep up with the rigorous pace of the equitation finals, so Lauren, her family, and her trainer Tom Thorpe, decided she needed a new mount. However, the transition was hard for Lauren, who had loved Chema dearly. Collin is very different than Chema, but he has some similarities, too. Mallory Pertler rode Designed For Success to win the WalkTrot Pleasure 12 Under qualifier and championship under the direction of Ray Krussel. Midwest was Lauren’s third show with Collin this year. The pair had taken a blue and two seconds at the IASHA Spring Warm Up, and then third in the Good Hands at Indianapolis Charity before arriving at Midwest. They took second in the Good Hands qualifier before entering the ring once more for the Pleasure Equitation Championship, where Lauren’s only goal was to get through the pattern successfully and show that they could do it. “Collin is big and the tight circles kind of scare me sometimes because he’s still learning to listen and turn,” Lauren said. But they aced the pattern — tight circles and all — and were called for the tricolor. Collin was bred by the Erffmeyers, also clients at Northern Tradition, and trainer Tom broke and trained him from the start. He was picked to be a horse on which Lauren could finish out her equitation career, and he is shaping up to be just that. According to Tom, every day is Collin’s favorite day and every job is his favorite job. The history of the horses who have made their debuts here is the proof that’s in the shavings — World’s Grand Champions have started out winning the UPHA Classics here, new combinations have put their talents and experience to the test here, quickly becoming the epitome of their division. Lessons are learned in this ring that may not result in a blue ribbon, but are the stepping-stones to wearing the roses in August. 2015 saw the type of competitive classes I was used to while growing up, with perhaps some of the strongest and deepest pony classes you won’t see again until August. World’s Champions met up against new combinations, while tried and true competitors reigned supreme. Saddle Seat Equitation 14 17 Champion Aleia Brown aboard her beloved Thomas. Thomas also carried trainer Erin Richey to the Trainers Equitation Cup win Thursday night.Born On The Bayou made her first Midwest Charity Horse Show performance, picking up the red ribbon in the Open qualifier and returning to the championship for the blue, red and yellow streamers. The reigning Open 50” and Under World’s Champion with Maureen Campbell, she made her debut with Meredithe Steinhauer at ASHAV last fall. This daughter of amateur champion Sugarland took the final pass Saturday night. CH Stat served as the Reserve Grand Champion with Doug Mesker on the lines. This many-time World’s Champion Over 50” Roadster took the final pass in the Open qualifier. Sugarland loves Midwest. 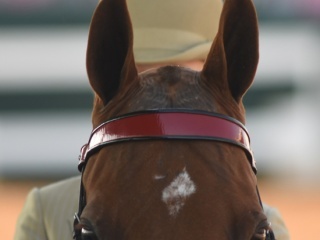 You can see it on the two-time defending World’s Grand Champion Amateur Roadster Pony’s face. He returned with owner and driver Elisabeth Goth to claim the Amateur Roadster Pony qualifier and championship for the third year in a row by unanimous decision. Majestic Oaks trains the team. Hopkins is another Midwest veteran, showing in the Limit Roadster Pony class after taking reserve just a year ago. After claiming a win in the Novice class at River Ridge Charity, he returned to the Limit class with owner and driver Toni Nastali to claim the blue. Ashley Creekmore and Outside The Lines returned to Midwest this year after being reserve in the AHHS Youth Medallion Roadster class just last year. They repeated that performance, but took home the blue in the Junior Exhibitor Roadster Pony class under the direction of Hollow Haven Farm. 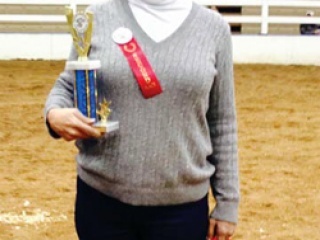 Kirstie Buerkley knows her way around a Juvenile Roadster Pony class. The first two seasons she showed Dun-Haven Grandiose she went undefeated and has been catch driving and winning ever since. She made one performance at Midwest in the Roadster Pony division, winning the AHHS Youth Medallion Roadster to Bike with Regal’s Perfect Song LF for Ashlyn Farm LLC. 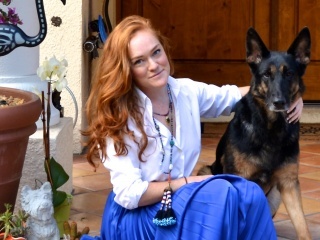 Kirstie has been trained throughout her career by Majestic Oaks. The under saddle qualifier for the AHHS Youth Medallion Finals belonged to Madison Pope and Heartland Part Time. Madison being the reigning National Champion with Perfect Offering, showed her skills with this young pony by X-Treme. The entry of Melvin L. Jennings and Carol Lawson, Party Time was the unanimous choice for the blue. 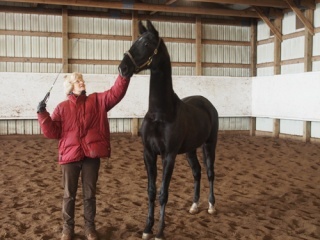 Lisa Hilmer trains Madison and Party Time. Georgia Blevins was in the bike to win the Junior Road Pony class behind Regal’s Decision LF. Bred by Light Farm, Decision is by Dun-Haven Regal Attraction and out of the mare Romeo’s Miss Mandy LF. Regal’s Decision is trained by Majestic Oaks. There are very rare moments when you turn your head and go “who the heck is that? !” Many spectators were having that moment during the UPHA Roadster Pony Classic when Tom Lowry burst through the gate with Prime Time Choice LF. By Romeo’s Prime Time LF and out of the Regal Attraction mare, Regal’s Chloe LF, this entry of Golden Creek Farm turned heads. In just his third performance, Prime Time took home the honors at the Illinois State Fair in the Three-Year-Old Roadster Futurity as well as claimed the AHHS National Breeders’ Futurity championship for three-year-old road ponies. McGee Bosworth and CH Lets Talk were the Amateur Three Gaited Park Champions and Grand Champions.Steve Golden marched Heartland Marching Orders to the Harness Pony Grand Championship under the direction of Chris Gantley and Heartland Hackney. Reserve in both the Amateur Gentleman’s and Amateur Harness Pony Championship, they returned to claim tricolor honors Saturday night. Handsome Harry made the winning performance in the Open Harness Pony qualifier with Jeff McClean on the lines for Golden Creek Farm. 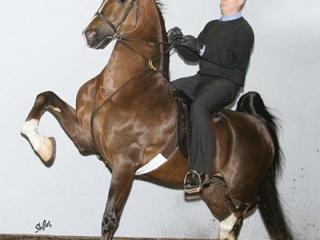 By Twin Willow’s Handsome Dan, Harry is the reigning World’s Champion Four-Year-Old Harness Pony. Heartland Demonstrator and Mary Gaylord McClean dominated the Amateur Harness Pony division, winning the qualifier and championship in unanimous fashion for Golden Creek Farm. 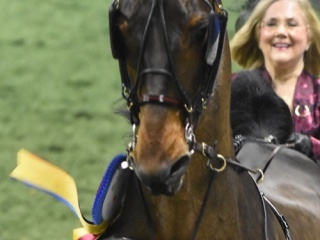 Mary and Demonstrator are the reigning World’s Grand Champions in the Amateur Harness Pony division as well as the World’s Champions in the Amateur Ladies Harness Pony division. Topping the Amateur Gentleman’s Harness Pony qualifier was the highly celebrated The Remington with John Wrather on the lines for Charlotte Wrather. This pair is coming off four wins from River Ridge and Bonnie Blue in the Harness Pony division. The Reserve World’s Champion in the Harness Pony Stallion/Gelding Stake just a year ago, they claimed the unanimous blue under the direction of Majestic Oaks. 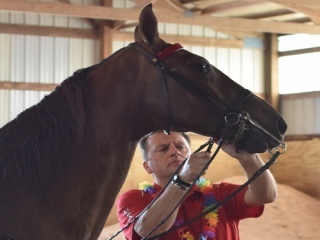 For the second consecutive year, Crystal Creek’s Captain Mike wore the blue ribbon in the Limit Harness Pony class with Maureen Campbell on the lines for Sandra Surber. The reigning World’s Grand Champion Junior Harness Pony is by CH Crystal Creek’s Commander and out of the mare WC Hawkeye’s Dark Angel. Captain Mike was bred by Crystal Creek Farm. Toni Nastali showed her versatile driving skills to earn the unanimous UPHA Harness Pony honors with World’s Champion Three-Year-Old Harness Pony Heartland Copper Illusion. Shown last year as a three-year-old to a reserve in the limit class, Copper Illusion has made his debut this year with Toni to much success. Richmond DeHart aboard Callaway's When The Stars Go Blue.WGC Heartland Globetrotter took the last pass in the Hackney Pony Championship in unanimous fashion with John Wrather on the lines for the second year in a row. 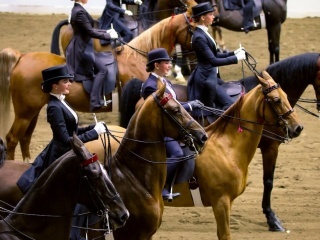 This team is trained by Majestic Oaks Hackney and is also the reigning World’s Champion in the Amateur Gentleman’s division and ended last season as Reserve National Champions in the Amateur Cob Tail division. They took the reserve honors in the Amateur Gentleman’s division earlier in the week. Holli Hayes guided the reigning World’s Grand Champion Heartland Majestic to the unanimous blue ribbon in the Open Hackney Pony qualifier for owner Elisabeth Goth for the second consecutive year. This team wore the roses in the Kentucky County Fair Championship in August in addition to taking the last pass in the Limit class at the American Royal. Mary Gaylord McClean expertly guided the energetic Heartland Road Show to both the Amateur Ladies and Amateur Cob Tail wins, both in unanimous fashion for Golden Creek Farm. This team is the reigning Reserve World’s Champion in the Amateur Cob Tail division. Tom Lowry and Jeff McClean were on hand to assist with the victory passes. Jeff McClean made the drive to be the Amateur Gentleman’s Cob Tail winners with Heartland Dressed To Impress. Formerly a World’s Grand Champion Junior Road Pony, Heartland Dressed To Impress made her debut by winning the Open Cob Tail division at Rock Creek. Craycroft Matador took the Limit class with Juan Rios on the lines for Blevins Farm, and the unanimous support of the judges. Matador is coming off two wins from his season opener at J.D. 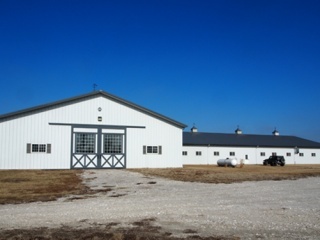 Massey and is trained by Majestic Oaks Hackney Farm. 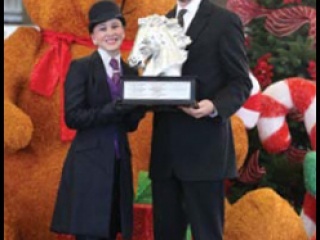 Patrice Watson O’Brien and the reigning Junior Cob Tail World’s Grand Champion, Heartland Infinity, made a beautiful performance to earn the UPHA Hackney Pony Classic for Ashlyn Farms, this is the second year in a row for the Majestic Oaks trained team. Infinity is also the reigning UPHA Classics National Champion. Brianna Meyer and CH Heartland Accolade took the reserve championship streamers back to the Hollow Haven tack room. Many times a World’s Champion in this division, Brianna drives for the Brown/Anderson Farm. Catch Me If You Can and John Wrather took the unanimous blue ribbon in the Pleasure Driving qualifier under the direction of Majestic Oaks. This team also swept the division at River Ridge. In 2014, they were the Reserve World’s Champions, Div. 1, at Louisville. The new combination of Olivia Schumacher and The Ivy League have been scoring wins across the country together. 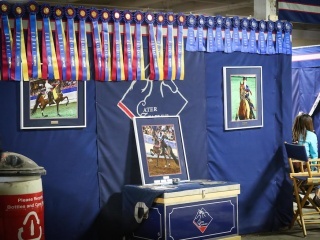 They topped the AHHS Youth Medallion Pleasure Pony qualifier as well as the Junior Exhibitor Pleasure Pony Championship. Ivy is the reigning Reserve World’s Grand Champion in the Junior Exhibitor division and the reigning National Champion in the AHHS Youth Medallion Finals. Dominating the under saddle division, Madison Pope took the last pass in the AHHS Pleasure Pony Under Saddle class with Uptown Funk. Another new face for Madison, Uptown Funk makes 2015 the first year for him under saddle. Exotica and Mary Gise topped the Limit Pleasure Pony class under the Hollow Haven banner. This team kicked off the year a reserve champion at River Ridge. A former roadster pony, Exotica garnered Limit Pleasure Pony wins at such shows as Oshkosh Charity and Blue Ridge in 2014. Romeo’s Namesake LF and Jo Capitani made the last pass in the Junior Pleasure Pony class for Dan and Leah Light of Light Farm. 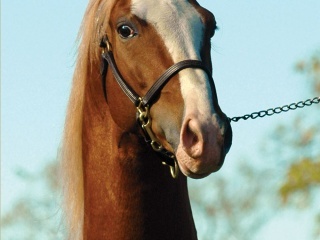 By Romeo, Namesake was reserve in the Midwest Hackney Futurity, as well as the AHHS National Breeders’ Futurity. CH Velvet King and Susan Courtney turned the tables on qualifier winners Samuel Adams and Helena Rosse in the Country Pleasure Driving Pony Championship. A relatively new division, Midwest is one of the few shows to first offer it last year.